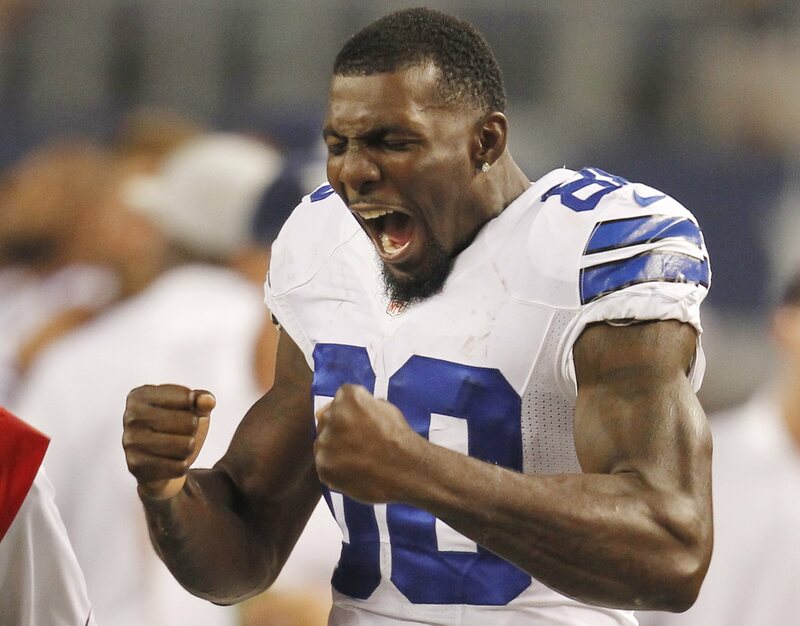 Desmond Demond “Dez” Bryant was born in Galveston County, Texas on November 4, 1988. He played collegiately at Oklahoma State University. He is currently a wide receiver in the NFL for the Dallas Cowboys, who drafted him in the first round of the 2010 NFL Draft. 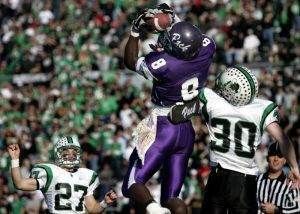 Dez Bryant was born in Galveston County, Texas, but eventually moved to Lufkin, Texas, where he attended Lufkin High School. He excelled in both football and track and field during his high school career. Bryant was one of the top performers in the entire state of Texas at triple jump with a career-best leap of 14.17m. He also excelled in the 110 and 300m hurdles. His best time in the 110m hurdle was 14.56 seconds and his best time the 300m hurdle was 40.70 seconds. Dez Bryant was also a member of the 4 x 100m relay team running a time of 40.62 seconds and the 4 x 200m relay running a time of 1:28.35. 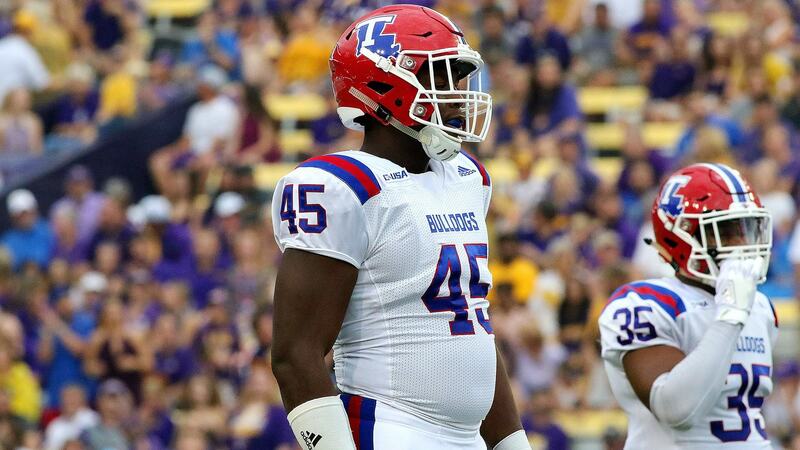 Although he was a top performer in track and field events, he really made a name for himself on the football field during his time at Lufkin High School. As a junior, he caught 48 passes for 1,025 yards and scored 16 touchdowns. He helped lead Lufkin to a 14-1 record, but eventually ended up losing to Southlake Carroll in the 5A Division II state semifinals 46-28. In his senior year, Dez Bryant caught 53 passes for 1,207 yards and scored 21 touchdowns. He once again helped lead his team to a winning record of 11-1, but lost to Round Rock in the area round of the playoffs. He was an All-State selection and was also named All-American by Parade and SuperPrep. After the season, he participated in the Offense-Defense All-American Bowl. Dez Bryant was regarded as a four-star recruit by Rivals.com and was listed as the #9 wide receiver prospect in the class of 2007. He was the second best rated receiver behind only Terrence Tolliver in the state of Texas. He was recruited by numerous collegiate programs and took official visits to Texas A&M, Oklahoma State, and Texas Tech, before ultimately deciding on Oklahoma State. 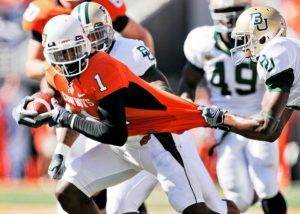 Dez Bryant attended Oklahoma State University from 2007 to 2009. As a freshman, Dez Bryant played in 12 games and caught 43 receptions for 622 receiving yards and scored six touchdowns, finishing second on the team. He set a freshman record for receiving yards (155) in a game against the University of Kansas. He was also named second-team Freshman All-American. In 2008, Dez Bryant finished the year with 87 receptions for 1,480 receiving yards and scored 19 touchdowns, including two punt returns for TDs. He earned All-American first-team honors from numerous outlets, joining running back Kendall Hunter as the first OSU sophomore position player to receive the national recognition since Thurman Thomas in 1985. Dez Bryant was also a first-team All-Big 12 choice and finalist for the Biletnikoff Award, given to the nation’s top wide receiver. This was in large part due to the fact he led the conference in receiving yards per game (113.9), scoring (9.7-tied for second in the nation), touchdown receptions (19), and punt return average (18.0). As a junior, Dez Bryant was a consensus All-American, All-Big Conference first-team selection, member of the Walter Camp Player of the Year Award, Maxwell Award and Biletnikoff Award Watch Lists in his final collegiate season in 2009. He played only three games in 2009 after he was ruled ineligible the rest of the season for violating NCAA bylaw. He didn’t fully disclose his interaction with Deion Sanders, which was the reason for his NCAA violation. He was considered a possible Heisman candidate prior to his suspension. Despite only playing three games, Bryant still finished third on the team with 17 catches for 323 yards and four touchdowns. He also had 111 yards on punt returns, including an 82 yarder that he returned for a touchdown. He finished the season with 477 all-purpose yards. Dez Bryant declared he would enter the 2010 NFL Draft on November 5, 2009. He was widely regarded as the best wide receiver in the draft class but his draft stock took a hit due to character concerns. The Dallas Cowboys held the 27th overall draft pick, but ended up trading with the New England Patriots to select Dez Bryant with the 24th overall pick. 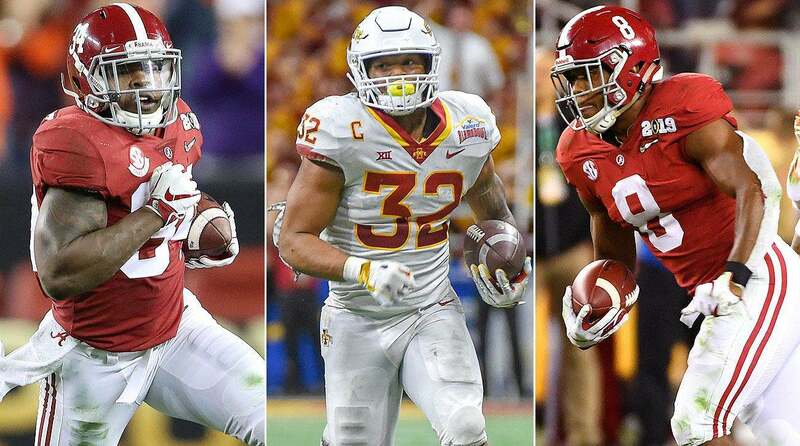 To trade up three spots, the Dallas Cowboys sent their third round draft pick (90th overall) and received the Patriots fourth round draft pick (119th overall) in return. 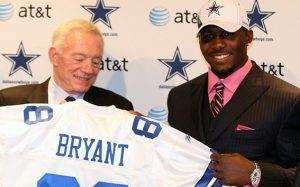 The Dallas Cowboys officially signed Dez Bryant to his rookie contract on July 22, 2010. The following day, on July 23, 2010 it was announced that Dez Bryant would wear number 88, the same jersey number that Hall of Famer Michael Irvin and Cowboys legend Drew Pearson wore during their playing days. Dez Bryant’s first official touchdown in the NFL came on a 31-yard pass from quarterback Tony Romo on October 17, 2010. His rookie season was officially cut short when he had to be placed on injured reserve after fracturing his ankle returning a kickoff against the Indianapolis Colts. He finished his rookie season with 45 catches for 561 yards and six receiving touchdowns. He also returned two punts for touchdowns, including a 93 yarder, averaged 14.3 yards per punt return and 24.4 yards per kickoff return. In 2011, Dez Bryant would start opposite Miles Austin after the Cowboys decided to part ways with Roy Williams. In the first game of the season, against the New York Jets, he had three receptions for 71 yards and scored a touchdown, but he suffered a thigh bruise that would cause him to miss the next game against the San Francisco 49ers. He finished his second season in the NFL with 63 catches for 928 yards and nine touchdowns. In 2012, Dez Bryant enjoyed the best season of his career thus far in the NFL. He finished the season with 92 receptions for 1,382 yards and 12 touchdowns; these ranked 10th, sixth, and third, among all wide receivers. He did have to play through several injuries in 2012. He injured his finger in early December, but opted to play through the pain for the betterment of the team. He also had to leave the final game of the season against the Washington Redskins in the fourth quarter due to a back injury. The injury was so severe that he could barely walk. In 2013, Dez Bryant had career highs in both receptions (93) and touchdowns (13). He also racked up 1,233 receiving yards. He finished eighth in the NFL in catches, 13th in yards, and third in touchdowns among all wide receivers. Based on his 2013 performance, Dez Bryant finally made his first Pro Bowl appearance. In 2014, Dez Bryant decided to have his best season as a professional. It also happened to be his last year of his rookie contract. He finished the 2014 season with 88 catches for 1,320 yards and 16 touchdowns. His 16 receiving touchdowns set a franchise record previously held by Terrell Owens (15). He also made his second Pro Bowl and was chosen as a first-team All-Pro. 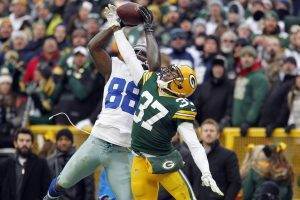 In 2014, Dez Bryant and the Dallas Cowboys would make the playoffs only to be knocked out in the divisional round by the Green Bay Packers. 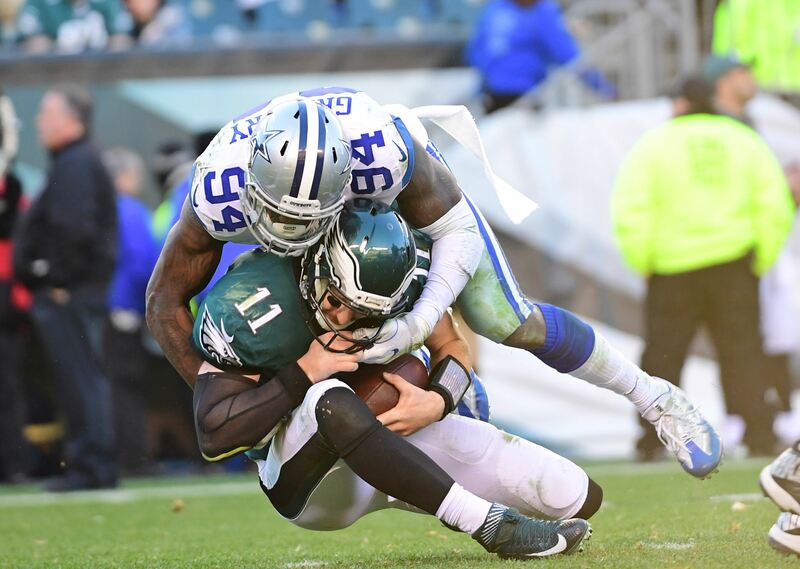 The Cowboys ended the 2014 season on a controversial catch in which Dez Bryant was involved. Initially, he was ruled as making the catch, which set the Cowboys up at the 1 yard line. The catch was challenged by Packers head coach, Mike McCarthy and was eventually overturned. The official ruling was that Bryant didn’t maintain possession of the ball all the way to the ground, thus not completing the catch. On March 3, 2015, the Dallas Cowboys placed the nonexclusive franchise tag on Dez Bryant. It wasn’t until July 15 that Bryant and the Cowboys were able to reach a five-year $70 million contract extension. In the first game of the season against the New York Giants, Dez Bryant left the game with a foot injury. X-rays later revealed that he had a stress fracture in his foot and that it would require surgery. The recovery time from the surgery was expected to be 4-6 weeks and he eventually returned in week 8 against the Seattle Seahawks. Dez Bryant was never quite himself in the 2015 season and was limited to just nine games. He ended the season with just 31 receptions for 401 receiving yards and three touchdowns. After the season, he underwent foot and ankle surgeries on January 6, 2016. The Dallas Cowboys signed Dez Bryant to a five-year $70 million contract with $32 million fully guaranteed on July 15, 2015. He will make an average of $14 million per season and his contract makes him the 6th highest paid of 382 wide receivers in the NFL. It will be really interesting to see what the Dallas Cowboys decide to do with Dez Bryant once his contract expires.